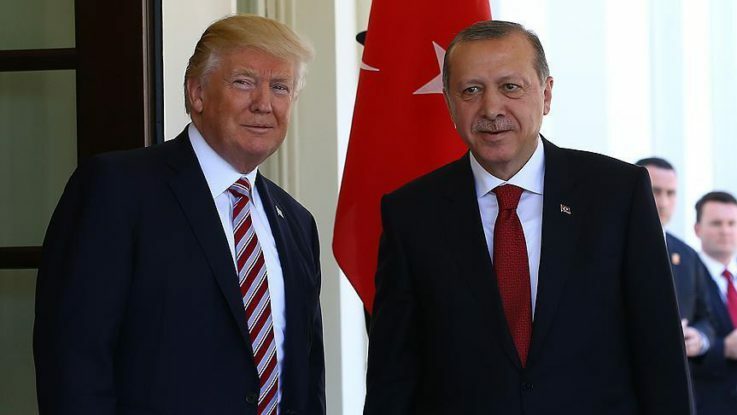 Turkish President Recep Tayyip Erdogan is likely to discuss ongoing Gulf crisis with U.S. President Donald Trump in the next few days. “In the coming days, I think Trump and our president will also discuss [Gulf crisis]. [US Secretary of State] Tillerson said on the phone, ‘Trump wants to discuss with President Erdogan’,” Turkish Foreign Minister Mevlut Cavusoglu said. Talking to media representatives at Turkish parliament, Cavusoglu said they are contacting everyone regarding the crisis that has seen several Arab countries severing ties with Qatar. He added that Turkey was making active efforts to help resolve the crisis before Muslim’s Eid festival. The minister said some Arab countries are accusing Qatar of being close to Iran and supporting terrorism. “We are against both of these accusations and we told it to all of them,” he said. Cavusoglu said that Muslim Brotherhood is not a terrorist organization but an opposition group. “Muslim Brotherhood is not a terrorist organization. It is not an armed terrorist organization, but is an opposition group. You like it or not. Now, the Brotherhood is in coalition government in Tunisia. In Kuwait it is both in parliament and government. The same is valid for Bahrain,” he stressed. Since the ouster of Mohamed Morsi — Egypt’s first freely elected president and a Brotherhood leader — in a 2013 military coup, the group has been banned in Egypt, Saudi Arabia and the United Arab Emirates (UAE). The Brotherhood stressed its commitment to “peaceful” means of protest with a view to reversing Egypt’s 2013 coup, which was openly supported at the time by Riyadh and Abu Dhabi. On 5 June, five Arab states — Saudi Arabia, Egypt, the UAE, Bahrain and Yemen — abruptly cut diplomatic ties with Qatar, accusing it of supporting terrorism. Mauritania followed suit the following day, while Jordan has downgraded its diplomatic relations with Doha. Saudi Arabia has also closed its land borders with Qatar, geographically isolating the tiny Gulf state. Doha, for its part, strenuously denies the accusations against it, describing recent moves to diplomatically isolate it as “unjustified”.